Preheat oven to 405 degrees. Cut sweet potato in half, place on baking sheet, and bake for 25-35 minutes, until super soft. Remove skin. Place soft sweet potato and banana in the blender or food processor and puree. Then add flaxseed meal, baking soda and powder, and cinnamon. Puree until completely broken down and smooth. Then add the wet ingredients: coconut oil, eggs, maple syrup, and vanilla extract. Line muffin tin with paper or silicone liners and use spoon to scoop out and pour ingredients into each cup. Bake muffins for 25-30 minutes or until you poke them with a toothpick and it comes out clean. 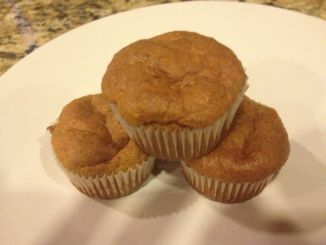 Let muffins cool before consuming, it helps the muffins meld together a bit more.